The Sangeet, of all the wedding ceremonies, is one such a great evening that is most awaited not only by the couple's’ family but also by everyone who is invited. It is the night of absolute fun where everyone can join in the joy surrounding the wedding celebrations through the simplest means of dance, music, & entertainment! But a lot goes into making this evening as special as it can be the hours of dance practices, coordination of steps, but most of all are the selection of great songs that is bound to entertain your wedding sangeet guests. Even though trends are there in song selections and performances that may have seen changes over the years, the basic idea of having a great time while organizing the dance show that has been stayed the same. Besides, with a number of great friends and family bopping to the fantastic desi beats at the sangeet night which is bound to be an electrifying evening! But surely the bride would love to bring out a few of your own amazing ideas into play… well, here is where we help! Below are the themes & sangeet night ideas from which you can take an inspiration! Both music and pictures have the power to say what words can’t, so imagine how powerful a performance will be if both of these things are brought together. While the pictures slideshow can go on in the background, having a dance and song representing every picture can be staged. This is not only an innovative idea; it also gets your guests engaged in the performance. Letting an array of songs can tell the story of how you met or how as a couple you both are meant to be, is an adorable way to stage a sangeet performance. While some couples have their families to join forces and perform together, that way getting them more an acquainted; other couples that have a two-sided performance, therefore adding to an excitement as to which side performed better. Either way, everyone has fun, which is the main reason and purpose of a sangeet. And since it is a Skit, the songs can range from any latest Bollywood to classics or an even International hit wherein the lyrics represent steps of your life. At times even witty snippets of commentary or an impersonation are imbibed in between the songs to add to the entertainment and laughter! It can happen that the bride and bridegroom can be from culturally different backdrops to that there would be nothing better than using it as an opportunity for an amazing ‘Desi Themed Song-&-Dance’ in which the song selections would be a fusion of beats from both cultures. Where, for example, with a folk-like Punjabi song there can be a Gujarati Garba dance. This blending represents a union of two families creative way of celebration! Wherever there is an Indian wedding event management, Bollywood song or dance is added to it automatically! Any why should not it? After all Bollywood dances and Music does have the most thrilling beats which can get anyone on their feet to the rhythm. There are multiple options which are available from laser shows to fire dancers. 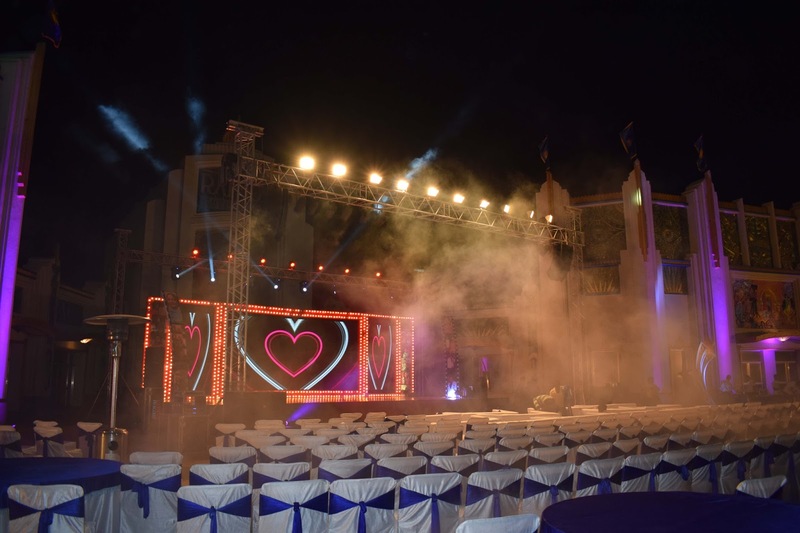 If you want to add something more special and amazing to the night you can choose from the many options which are available by professional performers from wedding event planner. During sangeet, the families come together to celebrate an act of two young hearts coming together. Relatives from out of state and even out of the country will gather and bring bits and pieces of their newly adopted cultures. In olden times, the sangeet used to serve as a short period of rest from all the tensions and seriousness of the wedding preparations. For an amazing wedding, events opt for the best wedding event planner. The women of the house can prepare the bride for her wifely duties through songs, at the same time conveying to her their love. Ceremonies like this can prove how much of a social importance and event like a wedding that wedding event management holds in the lives of Indians.